The efficacy of glucosamine and/or chondroitins in knee osteoarthritis (OA) has been controversial. A recent large, randomized, multicenter trial (the GAIT trial) found no symptomatic or structure-modifying benefit of glucosamine or chondroitin, alone or in combination. However, prior studies conducted in Europe using different formulations have suggested the possibility of structure modification with chondroitin sulfate (CS). 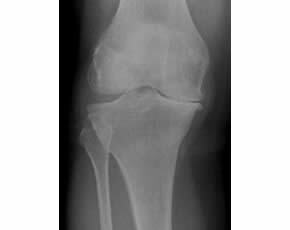 Here, Kahan et al (Arthritis Rheum 2009; 60(2): 524) explore the efficacy of CS in improving symptoms and delaying radiographic progression of symptomatic knee OA. Subjects with painful medial tibiofemoral knee OA, without end-stage disease, were randomized 1:1 to receive CS (administered as an 800 mg dose of purified chondroitins 4 and 6 sulfate dissolved in water and taken daily) vs. identical placebo. Subjects were enrolled in France, Belgium, Switzerland, and the U.S. Subjects underwent follow-up fluoroscopically aligned knee radiographs at 12, 18, and 24 months with change in minimum joint space width (JSW) of the medial compartment predefined as the primary outcome measure. OA symptoms and the used of allowed rescue medications (acetaminophen and NSAIDs) were assessed every 3 months. Among 1052 screened subjects, 622 were enrolled (n=313 placebo, n=309 CS). A similar number of placebo and CS treated subjects completed the two years of the study (n=217 placebo subjects (69%) and n=206 CS subjects (67%)). Women comprised 68% of enrolled subjects with a mean age of 62 years. Most (57%) of subjects had advanced (Kellgren/Lawrence grade 3) knee OA with a mean duration of symptoms of approximately 6 years. Baseline characteristics, including the minimum JSW width of the median compartment, were balanced between the two groups. In intent-to-treat analyses, minimum medial JSW decreased in both the CS and placebo groups; however, the average decrease in minimum JSW at 24 months was significantly less in the CS treated group (-0.07 mm) compared to the placebo treated group (-0.31 mm) (p<0.001). The percentage of those designated as having radiographic progression was 28% in the CS group vs. 41% in the placebo group (p<0.001), with the number needed to treat (NNT) to prevent radiographic progression of 8. Treatment with CS was significantly more effective in subjects with higher baseline BMI. Symptoms (measured with VAS for pain and WOMAC pain) decreased in both groups and were did not statistically differ at 24 months. Adverse events were minimal and were balanced between the groups. Daily use of CS was associated with a reduction in progression of joint space narrowing of the medial compartment of the knee in patients with painful knee OA. The findings of this study differ from that of the GAIT trial, in which no structural benefit of chondroitins were detected. The discrepancy in results could be related to differences in the agents used (the CS studied here is a regulated product produced as a prescription drug) or potentially in the way the outcomes were measured. Whatever the reason, the differences between CS and placebo in delaying radiographic progression do appear to be robust. Whether CS is a symptom modifier is less clear from this study, as early separation in symptoms was not maintained through the study interval, raising the question whether the mechanism under which CS protects cartilage may be disconnected from that which leads to pain. Given the absence of disease modifying OA agents, these findings are promising, and deserve confirmation with longer term studies that include a hard outcome (i.e. need for joint replacement) and potentially a more sensitive measure of cartilage (i.e. with MRI) to be entirely convincing.